Using the mechanical key in order to perform the following operations. 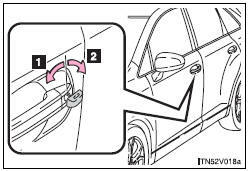 Turning the key rearward unlocks the driver’s door. Turning the key once again within 3 seconds unlocks the other doors.